This article is about the historian. For other Edward Gibbons, see Gibbon (disambiguation). 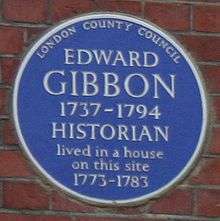 Edward Gibbon FRS (/ˈɡɪbən/; 8 May 1737 – 16 January 1794) was an English historian, writer and Member of Parliament. His most important work, The History of the Decline and Fall of the Roman Empire, was published in six volumes between 1776 and 1788 and is known for the quality and irony of its prose, its use of primary sources, and its open criticism of organised religion. He also met the one romance in his life: the daughter of the pastor of Crassy, a young woman named Suzanne Curchod, who was later to become the wife of Louis XVI's finance minister Jacques Necker, and the mother of Madame de Staël. The two developed a warm affinity; Gibbon proceeded to propose marriage, but ultimately wedlock was out of the question, blocked both by his father's staunch disapproval and Curchod's equally staunch reluctance to leave Switzerland. 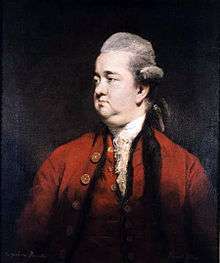 Gibbon returned to England in August 1758 to face his father. There could be no refusal of the elder's wishes. Gibbon put it this way: "I sighed as a lover, I obeyed as a son." He proceeded to cut off all contact with Curchod, even as she vowed to wait for him. Their final emotional break apparently came at Ferney, France in the spring of 1764, though they did see each other at least one more time a year later. His second work, Memoires Litteraires de la Grande Bretagne, was a two volume set which described the literary and social conditions of England at the time, such as Lord Lyttelton's history of Henry II and Lardner's work on the Credibility of Gospel History. Gibbon's Memoires Litteraires failed to gain any notoriety, and was considered a flop by fellow historians and literary scholars. 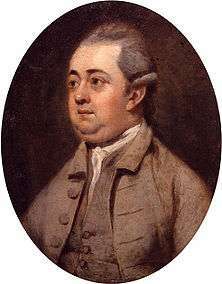 Gibbon returned to England in June 1765. His father died in 1770, and after tending to the estate, which was by no means in good condition, there remained quite enough for Gibbon to settle fashionably in London at 7 Bentinck Street, independent of financial concerns. By February 1773, he was writing in earnest, but not without the occasional self-imposed distraction. He took to London society quite easily, joined the better social clubs, including Dr. Johnson's Literary Club, and looked in from time to time on his friend Holroyd in Sussex. He succeeded Oliver Goldsmith at the Royal Academy as 'professor in ancient history' (honorary but prestigious). In late 1774, he was initiated a freemason of the Premier Grand Lodge of England. In November of that year he was elected a Fellow of the Royal Society, the main proposer being his good friend Lord Sheffield. Gibbon is believed to have suffered from an extreme case of scrotal swelling, probably a hydrocele testis, a condition which causes the scrotum to swell with fluid in a compartment overlying either testicle. In an age when close-fitting clothes were fashionable, his condition led to a chronic and disfiguring inflammation that left Gibbon a lonely figure. As his condition worsened, he underwent numerous procedures to alleviate the condition, but with no enduring success. In early January, the last of a series of three operations caused an unremitting peritonitis to set in and spread, from which he died. The "English giant of the Enlightenment" finally succumbed at 12:45 pm, 16 January 1794 at age 56. 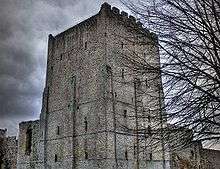 He was buried in the Sheffield Mausoleum attached to the north transept of the Church of St Mary and St Andrew, Fletching, East Sussex, having died in Fletching while staying with his great friend, Lord Sheffield. Gibbon's estate was valued at approx. £26,000. He left most of his property to cousins. As stipulated in his will, Sheffield oversaw the sale of his library at auction to William Beckford for £950. Gibbon's work has been criticised for its scathing view of Christianity as laid down in chapters XV and XVI, a situation which resulted in the banning of the book in several countries. Gibbon's alleged crime was disrespecting, and none too lightly, the character of sacred Christian doctrine, by "treat[ing] the Christian church as a phenomenon of general history, not a special case admitting supernatural explanations and disallowing criticism of its adherents". More specifically, the chapters excoriated the church for "supplanting in an unnecessarily destructive way the great culture that preceded it" and for "the outrage of [practicing] religious intolerance and warfare". Gibbon, though assumed to be entirely anti-religion, was actually supportive to some extent, insofar as it did not obscure his true endeavour – a history that was not influenced and swayed by official church doctrine. Although the most famous two chapters are heavily ironical and cutting about religion, it is not utterly condemned, and its truth and rightness are upheld however thinly. The subject of Gibbon's writing as well as his ideas and style have influenced other writers. Besides his influence on Churchill, Gibbon was also a model for Isaac Asimov in his writing of The Foundation Trilogy, which he said involved "a little bit of cribbin' from the works of Edward Gibbon". Evelyn Waugh admired Gibbon's style but not his secular viewpoint. In Waugh's 1950 novel Helena, the early Christian author Lactantius worried about the possibility of "'a false historian, with the mind of Cicero or Tacitus and the soul of an animal,' and he nodded towards the gibbon who fretted his golden chain and chattered for fruit." ↑ D. M. Low, Edward Gibbon. 1737–1794 (London: Chatto & Windus, 1937), p. 7. ↑ Norton, Letters, vol. 3, 10/5/86, 45–48. ↑ Stephen, DNB, p. 1130; Pocock, Enlightenments of Edward Gibbon, 29–40. At age 14, Gibbon was "a prodigy of uncontrolled reading"; Gibbon himself admitted an "indiscriminate appetite". p. 29. ↑ Pocock, Enlightenments of Edward Gibbon. for Middleton, see pp. 45–47; for Bossuet, p. 47; for the Mallets, p.23; Robert Parsons [or Persons], A Christian directory: The first booke of the Christian exercise, appertaining to resolution, (London, 1582). In his 1796 edition of Gibbon's Memoirs, Lord Sheffield claims that Gibbon directly connected his Catholic conversion to his reading of Parsons. Womersley, Oxford Dictionary of National Biography, p. 9. ↑ Womersley, Gibbon and the 'Watchmen of the Holy City': The Historian and His Reputation, 1776–1815 (Oxford University Press, 2002), as cited by G. M. Bowersock in The New York Review of Books, 25 November 2010, p. 56. ↑ John Murray (ed. ), The Autobiographies of Edward Gibbon. Second Edition (London: John Murray, 1897), p. 137. ↑ Norton, Biblio, p. 2; Letters, vol. 1, p. 396. a concise summary of their relationship is found at 396–401. ↑ Murray, p. 239. The phrase, "sighed [etc.]" alludes to the play Polyeucte by "the father of French tragedy," Pierre Corneille. Womersley, Oxford Dictionary of National Biography, p. 11. ↑ In the Essai, the 24-year-old boldly braved the reigning philosoph[e]ic fashion to uphold the studious values and practices of the érudits (antiquarian scholars). Womersley, p. 11; and The Miscellaneous Works, First edition, vol. 2. ↑ Womersley, Oxford Dictionary of National Biography, pp. 11, 12. Gibbon was commissioned a captain and resigned a lieutenant colonel, later crediting his service with providing him "a larger introduction into the English world." There was further, the matter of a vast utility: "The discipline and evolutions of a modern battalion gave me a clearer notion of the phalanx and the legion; and the captain of the Hampshire grenadiers (the reader may smile) has not been useless to the historian of the Roman empire." Murray, p. 190. ↑ Pocock, "Classical History," ¶ #2. ↑ Cecil, Algernon. Six Oxford thinkers: Edward Gibbon, John Henry Newman, R.W. Church, James Anthony Froude, Walter Pater, Lord Morley of Blackburn. London: John Murray, 1909, p. 59. ↑ Cecil, Algernon. Six Oxford thinkers: Edward Gibbon, John Henry Newman, R.W. Church, James Anthony Froude, Walter Pater, Lord Morley of Blackburn. London: John Murray, 1909, p. 60. ↑ Cecil, Algernon. Six Oxford thinkers: Edward Gibbon, John Henry Newman, R.W. Church, James Anthony Froude, Walter Pater, Lord Morley of Blackburn. London: John Murray, 1909, p. 61. ↑ i.e., in London's Lodge of Friendship No. 3. see Gibbon's freemasonry. ↑ "GIBBON, Edward (1737-94), of Bentinck St., London; Buriton, Hants; and Lenborough, Bucks.". History of Parliament Online. Retrieved 10 May 2016. ↑ Gibbon's Whiggery was solidly conservative: in favour of the propertied oligarchy while upholding the subject's rights under the rule of law; though staunchly against ideas such as the natural rights of man and popular sovereignty, what he referred to as "the wild & mischievous system of Democracy" (Dickinson, "Politics," 178–79). Gibbon also served on the government's Board of Trade and Plantations from 1779 until 1782, when the Board was abolished. The subsequent promise of an embassy position in Paris ultimately aborted, serendipitously leaving Gibbon free to focus on his great project. ↑ Norton, Biblio, pp. 37, 45. Gibbon sold the copyrights to the remaining editions of volume 1 and the remaining 5 volumes to publishers Strahan & Cadell for £8000. The great History earned the author a total of about £9000. ↑ Norton, Biblio, pp. 49, 57. Both Norton and Womersley (Oxford Dictionary of National Biography, p. 14) establish that vol. IV was substantially complete by the end of 1783. ↑ Norton, Biblio, p. 61. ↑ "Fellow Details". Royal Society. Retrieved 10 May 2016. ↑ J. E. Norton (ed. ), The Letters of Edward Gibbon. Volume Three. 1784–1794. Letters 619–878 (London: Cassell, 1956), p. 216. ↑ the term hydrocele specifies that the compartment is not connected to the peritoneal cavity, whereas the term inguinal hernia specifies a connecting passageway, however narrow. -ed. ↑ "Jellinek EH: "Varnish the business for the ladies." Edward Gibbons' decline and fall. J R Soc Med 1999;92:374–379." (PDF). Retrieved 16 August 2012. ↑ After more than two centuries, the exact nature of Gibbon's ailment remains a bone of contention. Patricia Craddock, in a very full and graphic account of Gibbon's last days, notes that Sir Gavin de Beer's medical analysis of 1949 "makes it certain that Gibbon did not have a true hydrocele...and highly probable that he was suffering both from a 'large and irreducible hernia' and cirrhosis of the liver." Also worthy of note are Gibbon's congenial and even joking moods while in excruciating pain as he neared the end. Both authors report this late bit of Gibbonian bawdiness: "Why is a fat man like a Cornish Borough? Because he never sees his member." see Womersley, Oxford Dictionary of National Biography, p.16; Craddock, Luminous Historian, 334–342; and Beer, "Malady." ↑ so styled by the "unrivalled master of Enlightenment studies," historian Franco Venturi (1914–1994) in his Utopia and Reform in the Enlightenment (Cambridge: 1971), p. 132. See Pocock, Enlightenments of Edward Gibbon, p. 6; x. ↑ Womersley, Oxford Dictionary of National Biography, 17–18. ↑ Henry Edwards Davis, An Examination of the Fifteenth and Sixteenth Chapters of Mr. Gibbon's History of the Decline and Fall of the Roman Empire (London: J. Dodsley, 1778). online. ↑ "CFCA - The Coordination Forum for Countering Antisemitism". www.antisemitism.org.il. ↑ Womersley, ed., Decline and Fall, vol. 1, ch. XVI, p. 516. see online Gibbon's first footnote here reveals even more about why his detractors reacted so harshly: In Cyrene, [the Jews] massacred 220,000 Greeks; in Cyprus, 240,000; in Egypt, a very great multitude. Many of these unhappy victims were sawed asunder, according to a precedent to which David had given the sanction of his examples. The victorious Jews devoured the flesh, licked up the blood, and twisted the entrails like a girdle around their bodies. see Dion Cassius l.lxviii, p. 1145. As a matter of fact, this is a verbatim citation from Dio Cassius, Historia Romana LXVIII, 32:1–3: The Jewish Uprising: Meanwhile the Jews in the region of Cyrene had put one Andreas at their head and were destroying both the Romans and the Greeks. They would cook their flesh, make belts for themselves of their entrails, anoint themselves with their blood, and wear their skins for clothing. Many they sawed in two, from the head downwards. Others they would give to wild beasts and force still others to fight as gladiators. In all, consequently, two hundred and twenty thousand perished. In Egypt, also, they performed many similar deeds, and in Cyprus under the leadership of Artemio. There, likewise, two hundred and forty thousand perished. For this reason no Jew may set foot in that land, but even if one of them is driven upon the island by force of the wind, he is put to death. Various persons took part in subduing these Jews, one being Lusius, who was sent by Trajan. ↑ Womersley, Decline and Fall, vol. 3, ch. LXXI, p. 1068. ↑ Burke supported the American rebellion, while Gibbon sided with the ministry; but with regard to the French Revolution they shared a perfect revulsion. Despite their agreement on the FR, Burke and Gibbon "were not specially close," owing to Whig party differences and divergent religious beliefs, not to mention Burke's sponsorship of the Civil List and Secret Service Money Act 1782 which abolished, and therefore cost Gibbon his place on, the government's Board of Trade and Plantations in 1782. see Pocock, "The Ironist," ¶: "Both the autobiography...."
↑ Roland Quinault, "Winston Churchill and Gibbon," in Edward Gibbon and Empire, eds. R. McKitterick and R. Quinault (Cambridge: 1997), 317–332, at p. 331; Pocock, "Ironist," ¶: "Both the autobiography...."
↑ London: Chapman and Hall, 1950. Chapter 6, p. 122. ↑ Original text: "Gibbon, Edward". Dictionary of National Biography. London: Smith, Elder & Co. 1885–1900.